A slightly bitter, golden colored beer with a good head. [email protected]Ølfestival København 2018 (Day 3) - fuzzy golden pour with a white head. Fruity and light malty with some citric lemon flavour, yeast, caramel, medium body, touch of citric spice into the sweet malty finish. UPDATED: NOV 24, 2018 Leicht golden Bernsteinfarbig. schwach haftender feinporiger schaum. malzig im gaumen , leicht alkoholisierend, langer Nachtrunk der leicht im Hals kratzt. passt zu hellem Kurzgebratenem Fleisch, Polenta mit Rosmarin und Pilzen. UPDATED: NOV 7, 2018 Bottle, 500 ml. I've waited much more from this. Deep hazy golden, tough white head, medium carbo. Aromas are very faint, mainly sweet malt and sweet melon, it has a slightly fruity character. The palate is very dull, basically it's sweet malt but nothing else. At least it's well balanced, but this is the only positive thing in this beer. Absolutely forgettable. A belgian, amber, very cloudy Abbey Tripel with very high, white head. Aroma is caramel, light raisin, hazel nut. Taste is bitter sweet. Pearly. Also named Grand Cru, witch is a clone... that was the one I tasted. 500mL bottle, pours a clear copper golden with a large white head. Aroma brings out a very nice Belgian yeast, light candied sugar, and light esters. Flavour is quite boozy, with Belgian yeast, light candied sugar, and a hint of esters. Very boozy, lacking some cohesion. It’s alright. UPDATED: FEB 13, 2018 Fruits, malt in aroma. Amber, haze with great head. Little sweetnesses, fruits. Medium body, smooth, high carbonation. 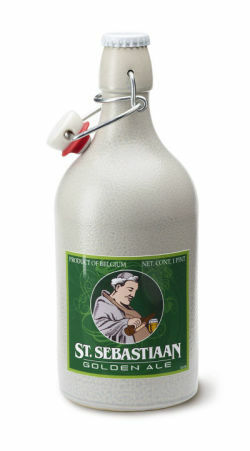 Mistig goudgeel bier met behoorlijke witte schuimkraag. Aroma van hooi, gist, mout, zure appel. Bitter, licht zuur. Licht prikkelend co2. F: big, white, long lasting. C: deep gold, light hazy. A: malty, honey, bit of orange peels, bit of spicy, coriander, yeasty, caramel, fruity. T: malty, fruity, honey, warming alcohol, spicy, coriander, grassy, caramel, medium body, medium carbonation, not bad, even enjoyed a little but boring, 0,5l bottle from Cora Woluwe-Saint-Lambert in Brussels.